A man has been found guilty of repeatedly beating and poisoning his ex-partner's 22-month-old daughter. Eve Leatherland had multiple fractures and a fatal dose of codeine in her system when she was found "stiff" in her bed in October 2017. 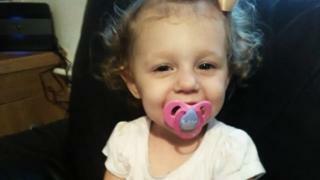 A jury took just three hours to convict Thomas Curd, 31, of murdering the toddler at Truro Crown Court. During the trial, jurors saw a number of photos and videos taken by the defendants that showed Eve looking extremely unwell in the days before her death in Liskeard, Cornwall. The court heard Eve's ribs and skull were fractured and refractured in "at least three" attacks, and she was poisoned with the painkiller in an attempt to mask the injuries. The court heard Eve had almost certainly been dead for several hours before her mother dialled 999 on 5 October 2017. Leatherland told 999 staff that Curd had "just been to check" on Eve and discovered she was not breathing. The paramedics who arrived two minutes later questioned this version of events after discovering that Eve's arms, legs and mouth appeared stiff. Mr Brunton said neither of the defendants "did a thing to help her" but instead seemed to have been playing video games, taking selfies, watching TV and sending messages "just feet away from where Eve was weakening and then dying on her bed". Speaking outside court, Det Insp Steve Hambly said: "Today's verdict marks the end of an 18-month investigation into some really quite harrowing circumstances. "We're talking about a 22-month-old child who within her own home has been repeatedly assaulted. "What has made this investigation particularly tough is that we know whilst those assaults and the poisoning of Eve took place, there were only two adults present and neither adult was able to help us in what had happened or even who had done what." The pair will be sentenced on Friday.